We were browsing through AT and we were intrigued by its coolness. It's a mirrored medicine cabinet. Just like the folks at AT we thought there was something special to it -- it has cold storage! 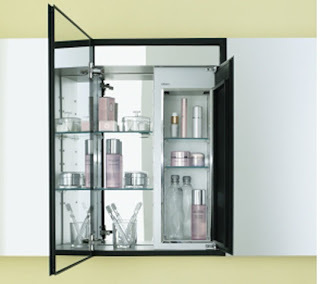 This medicine cabinet is part of the M Series line from Robern and can be surface mounted or semi-recessed. It would be great for storing nail polish, cremes, medicines that need to be chilled and even the convenient bottle of water. Luckily, this luxury medicine cabinet is temperature zoned so your toothbrushes aren't subject to the chilly conditions. Beautiful design blends artistic appeal with innovative functionality. The sophisticated elegance of M Series cabinets conceals practical cold storage that's ideal for bathrooms, spas and home gyms. Beverages and wellness and beauty products are perfectly chilled and conveniently close at hand.